By having a good weight of broadside that can be brought to bear regardless of wind conditions, this 80-gun ship is a significant force in any fleet. The ability to sail directly into the wind is something that no sail-powered vessel can ever match. The idea of going into battle with a fire raging in his ship’s belly was not one that appeals to every captain. 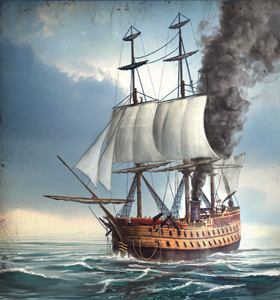 Fire was always a risk aboard a wooden vessel, and boiler explosions were not unknown. There was also the problem of coaling stations: while these ships carried sails, they did need regular supplies of coal. Steam was a tactical advantage, not a strategic one. Historically, the first British ship to be designed and built from scratch to use steam was HMS Agamemnon, laid down in 1852; previous steam warships were conversions from sailing ships-of-the-line. Agamemnon was fitted with sails and carried 91 guns. She also had a short career as the Navy’s pride and joy, as she was paid off in 1862. She did, however, help lay the first Transatlantic telegraph cable in 1857-8. A steam drydock is a basin for shipbuilding and repair that can be pumped dry by steam power. Steam engines also power much machinery.